Before your wedding invitations are printed, you will have to make a decision about what kind of printing method you would like to use. For some people this is a no brainer, you know exactly what you are looking for. But for many of my clients, they don't know where to start. So here is a little rundown on the different types of printing methods you can choose and the pricing that would accompany each. Hope this helps you feel confident in selecting and ordering your luxury wedding invitations! Flat printing is the most used method because of its cost and flexibility. Although it is the most cost effective, it also has attributes none of the others have. Like flat printing can also be mixed with any of the other printing methods, like shiny foil, to create a super artistic design. Most importantly, this style is the only way to get full color. We use this method to print all of our watercolor pieces. If whenever you think flat printing you think, smooth, dull copy paper, well expand your horizons. Because a beautiful design in full color printed on cotton or deckle edged paper, can be a show stopper. Elegant raised printing is perfect for text and single colored designs. Or for outlining watercolor, which gives it a luxurious finishing touch. But how is do you get raised printing? When printing, the wet ink is sprinkled with embossing powder and heated to create this shiny, raised effect. Doesn't the calligraphy look splendid like this? It can only be printed one color at a time, and is more labor intensive, so the price reflects that. But you come away with a textured invitation that is very impressive. We love letterpress printing here! The calligraphy is made into a "plate" of hard plastic that is inked and pressed into thick cotton paper, leaving a textured, elegant piece that your guests will swoon over. Above you will see a toasted oatmeal ink set into creamy paper and the way that the light hits the indents in the paper, you just could stare all day. Then this invitation was finished with edge painting on the thick cotton paper in a happy rose pink. So, although letterpress is more pricey, it is the utmost of style if you are looking for luxury wedding invitations. Foil printing is very similar to letterpress printing. The calligraphy is made into a plate, but this time the plate is made of metal. The printer heats the plate before it presses thin foil into the paper, leaving an indentation filled with your choice of fancy colored metal! It is just delicious with calligraphy. And we just can't seem to get enough. We are greatly looking forward to Christmas this year! Our boys are 6 and 7, and making the most of every moment. Baking cookies, decorating every square inch of the house, wrapping imaginary presents and of course making lists for Santa. I thought that I could help all of you get into the Christmas spirit with a colorful freebie! Here it is! Free Christmas Gift Tags are just that, free to all. click on the image above to direct you to my Christmas Shop. There you will find the fancy freebie and other things to tempt your fancy. While you're here look around a bit and drop me a line to let me know what you think. If you are looking for more magic, I have a larger set available for purchase. Remember, my husband is a minister, so all proceeds go to helping him run his ministry and to feed our little ones! Check out his ministry, GenLife, that is a para-church organization he started 6 years ago to make a Young Adult community in Detroit, where we both are from and still serve. We also had the pleasure of designing an elegant calligraphy invitation for her to be printed in shimmering gold foil on dark charcoal paper. Come fly away to Italy! 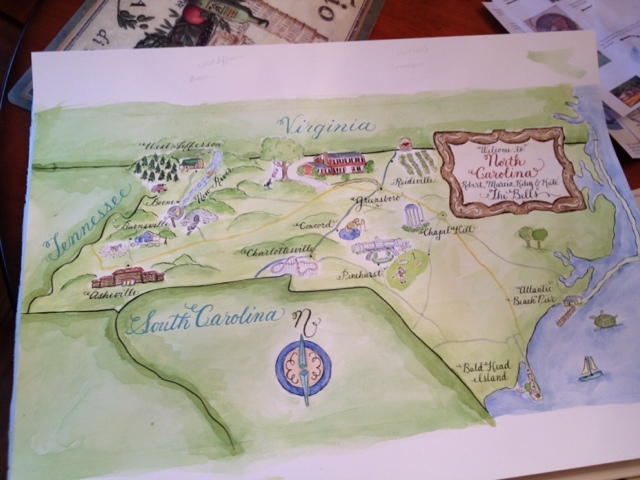 This luxury wedding map adorned the front of a lovely invitation suite to capture the bride's vintage shabby chic look. 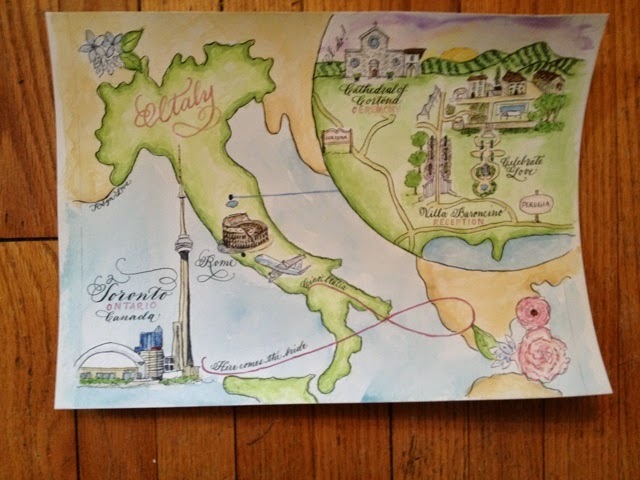 The map shows to flight from Toronto, Canada to the small Italian city north of Rome and surrounded by amazing vineyards. Enjoy the wedding! Are you having a destination wedding? Want a very unique invitation to mark your adventure. Contact me and lets design something grand together!